Favourites, favourites, favourites - it's another one of those posts! 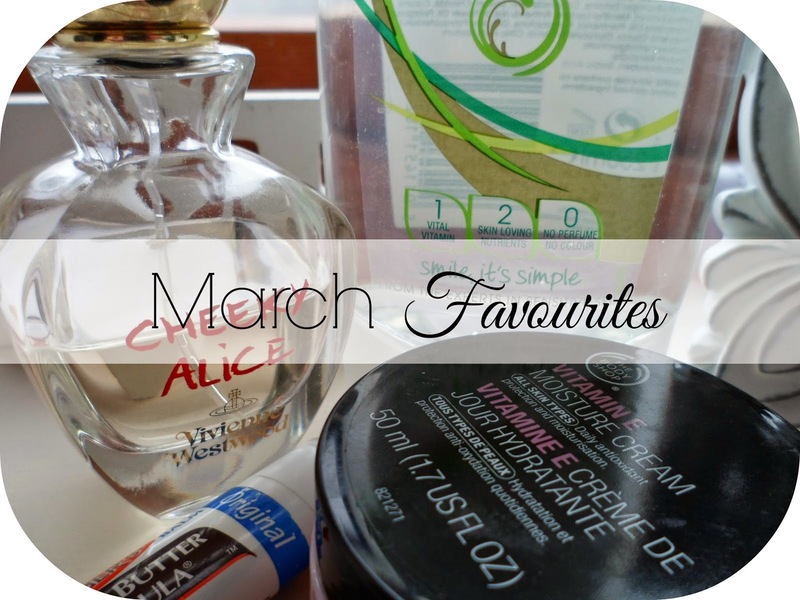 My favourites things I have been LOVING this month - aka March! Now I know this is mainly a beauty blog but as always they'll be a few extra's thrown in there - like to keep you on your toes don't I! First up Simple's Shower Gel! I have been having trouble with dry and irritated skin lately and I thought maybe the highly perfumed shower products (aka soap and glory) I had been using may have had something to do with it so I may the choice to try out a more 'simple' shower gel! This has made a great difference, my skin seems to feel alot better and I'm going to keep on using this for now - especially as it is discounted in Boots at the moment to about £1.30 - time to stock up! Now who isn't obsessed with Cocoa Butter?! Palmers is a brand I have used and I recently picked up their snazzy lip balm! This stuff has been a total lifesaver the last few weeks for me - with the drastic changes in weather and works air-con/heating my lips have been getting so sore and chapped and this has been seeing my through and helping me avoid that horrific "trip-lip" (as I like to call it)! Not only does it keep my lips hydrated and smooth whilst prevented chappedness but it also smells yummy and keeps my lip a gorgeous shine! I've already bought another one for when this runs out! Next up is my Body Shop Vitamin E Moisture Cream. I bought this back at Christmas in the half price sale and up until the beginning of March it had kind of been sitting in the corner! But I have told myself I need to moisturise this face alot more - especially at night so this has been my go-to product before I hit the hay at night! It smells lovely and fresh, isn't greasy and keep my skin feeling hydrated and plump - this stuff is yet again another barry bargain! Holy moly I have been addicted to this show! This past month or so I have watched ALL 5 seasons on Netflix.... yes I wasn't kidding when I said I was addicted! (I need to watch Season 6 asap!) This is like my dream show, like America's Next Top Model but for drag queens - ahhhh my god it's SO good! These guys are hotter girls than I'll ever be - and they are hilarious! Fav seasons have to be 4 and 5! I LOVE Sharon Needles, Wilam, Alaska, Detox, Jinyx Monsoon! The Pretty Reckless - Going To Hell. I have been waiting for this album for MONTHS! You all know that TPR are my fav band so of course I have't been dissapointed! Amazing band, amazing album - I HAVE to go and see them at the IOW Festival!! So there's another month's favourites for you guys - I feel like it's a bit thin on the ground this month so I apologise for that - being on a spending ban means alot less buying and trying new things (sad face). I've always wanted to try the cheeky Alice perfume, it looks so nice!